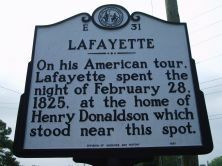 On his American tour, Lafayette spent the night of February 28, 1825, at the home of Henry Donaldson which stood near this spot. The Marquis de Lafayette, a Frenchman who served as a Major General in the Continental Army and was a close friend of George Washington, was invited by Congress to visit the United States as the guest of the nation. His visit, during the years 1824 and 1825, remains an unparalleled American journey. Lafayette arrived in New York in August 1824 and, over the next six months, toured New England and the middle states before traveling further south in February 1825. 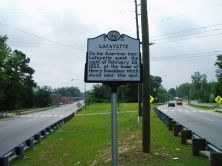 Lafayette’s first overnight stop in North Carolina was at Murfreesboro on February 26, 1825. On the morning of the 27th, he left Murfreesboro at about 11:00 A.M. and traveled about twenty miles to Northampton Court House (now the town of Jackson), where he was received by the official state welcoming committee. Lafayette and his entourage moved on to Halifax, where he gave an impassioned speech about liberty and freedom, dined in the Eagle Tavern, and stayed for the evening of February 27-28. After the stop in Halifax, Lafayette continued on to Raleigh, where he was guest of Governor Hutchins G. Burton. Numerous balls and festivities were held in his honor, and Raleigh’s social elite surrounded him. He was entertained in the home of Revolutionary War veteran William Polk. Afterwards the procession continued on to Fayetteville where the largest celebration in his honor was held. Formerly the town of Cross Creek, Fayetteville had been named in Lafayette’s honor in 1783.